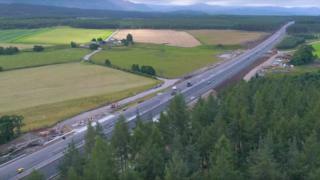 A new stretch of dual carriageway on the A9 south of Aviemore is nearing completion, Transport Scotland has said. Just over four miles (7.5km) of new road has been constructed between Kincraig and Dalraddy. The project has taken two years and cost £35m to reach its final stage. It is one of 12 sections of the A9 between Inverness and Perth to be upgraded from single to dual carriageway at a cost of £3bn. The overall scheme is to be completed in 2025. Cabinet Secretary for Economy, Jobs and Fair Work, Keith Brown, said: "When this section is open to traffic, drivers will enjoy safer opportunities to overtake, a reduction in frustration, reduced congestion, improved journey times and a better experience travelling between the central belt and Inverness." A shortlist of companies bidding to construct the next section of dual carriageway, just over five miles (9.5km) between Luncarty and Pass of Birnam in Perthshire, has now been drawn up. Mr Brown said: "Work on the A9 Dualling Programme is continuing at pace, with preferred routes having been identified for more than 90% of the programme, and we expect to award the contract for the Luncarty to Pass of Birnam section in the first half of 2018."